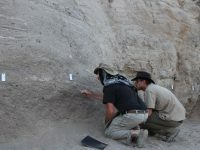 In a new study, scientists use urine salts to reconstruct the timing and scale of the Neolithic revolution at a Turkish archaeological site. A golf-ball-sized rhinoceros beetle flies through the open-air pavilion and lands on my table. I look up from my notes, an attempt at reworking my African wild dog study methods, and realize I haven’t seen one of these mighty beasts since my junior year in South Africa. The beetle is a welcome companion on this quiet, star-studded night in Jordan’s Ajloun Forest Reserve. Creature comforts: another perspective shift made possible by the Columbia Global Centers. As holidays approach and we plan our ‘seasonal’ migrations to see our families, many other species are making their own migrations — though with a few more snafus than we humans might hit. Despite being a keystone species in important ecosystems that span the northern and eastern North Pacific Ocean, sea otters have historically had a complex and sometimes troubling relationship with humans. Organisms in the natural world are constantly striving to avoid predation. Some prey depend on morphological characters to outsmart a worthy predator, utilizing camouflage or mimicry to avoid detection; others must engage in battle, relying on agility or strength. The Venezuela pebble toad, however, has an extremely peculiar defense mechanism: it rolls itself into the shape of a rock and bounces haphazardly down a hill.